If you are seeking dental treatment or enhancement in St Lucia, UQ Dental can provide a full range of dental treatments in a calm and comfortable environment. Dr Linda Tan and Dr Anne Fardoulys have practised on campus at the University of Queensland for more than 20 years. Anne and Linda and their dedicated team provide expert dental care to students, staff and local residents around St Lucia. 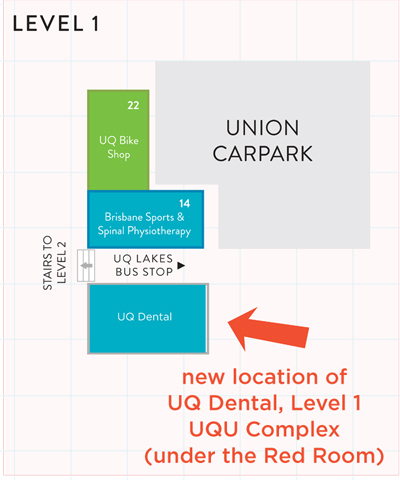 They are now practising in state-of-the-art surgeries in a new location in the University of Queensland Union complex, on Level 1.
teeth whitening with several individualised options. Their goal is to ensure that your dental experience is free of pain, and as pleasant as possible. We also utilise new technology and other traditional techniques to ease concerns of even the most anxious patient. Dr. Anne Fardoulys graduated from the University of Queensland in 1985. She leads a dedicated team committed to providing excellence in personalised dentistry. She understands the varied dental needs of a campus with a daily population of many thousands, ranging in age. She will take the time to talk over your dental health and requirements, and work out a convenient and cost-effective course of action. Dr Linda Tan also graduated from the University of Queensland. Her expertise and skill have ensured clients continue to receive the best in dental care and maintenance when they visit UQ Dental. UQ Dental charges fulltime students just $30 for a dental checkup. Just bring your smile and your student card! If you are seeking the very latest in bleaching, book in a $480 'Zoom' LED-activated bleaching in-surgery treatment using our modern equipment. Find out more here! We have competitive prices for bleaching procedures - fulltime students $260 for professionally made customised bleaching trays.